We have been reviewing the federal statutes that President Dwight D. Eisenhower invoked when he sent federal troops into Little Rock, Arkansas in the fall of 1957. I now want to switch gears, so to speak, to discuss three obscure cases arising directly out of the desegregation of Central High School in the fall of 1957: (1) Thomason v. Cooper, 254 F.2d 808 (8th Cir. 1958), (2) Jackson v. Kuhn, 254 F.2d 555 (8th Cir. 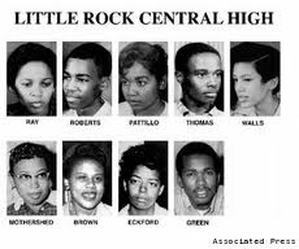 1958), and (3) Duncan v. Kirby, 311 S.W.2d 157, Supreme Court of Arkansas (1958). The last two cases challenged President Eisenhower’s legal authority to send federal troops into Little Rock, but let’s begin with Thomason v. Cooper, for it is this case that in many ways precipitated the crisis in Little Rock that fall. Unlike Mrs. Thomason’s case, the other two cases mentioned above arose after President Eisenhower sent U.S. troops into Little Rock; we will consider those cases in our next two posts.